Colorado Springs, Colo., April 10, 2014 /3BL Media/ – Junior Achievement USA® (JA) and The Allstate Foundation’s 2014 Teens & Personal Finance Survey reveals a gender gap among teenagers’ views and habits on college plans and future earning power. Junior Achievement USA has conducted the Teens & Personal Finance Survey for the last 15 years, partnering with The Allstate Foundation since 2005. The survey found that 91 percent of teen girls, ages 13-18, plan to attend college or trade school after they graduate from high school, compared to 86 percent of their male counterparts. Of teens planning to attend college, girls may be giving more thought to how they financially will achieve their goals. Seventy-nine percent of teen girls (ages 13-18) plan to seek scholarships/grants to pay for college, compared to 66 percent of boys 13-18. Sixty-six percent of teen girls say the rising costs of college have changed their decisions about their future college plans (versus 57 percent of teen boys), and 40 percent of teen girls say they are considering staying in-state to save money on tuition costs (versus 30 percent of teen boys). Since 2005, Junior Achievement and The Allstate Foundation have partnered to provide students with valuable information about personal finance in the classroom and help them apply it in their lives. The JA Economics for Success® program, created in partnership with The Allstate Foundation, has helped more than 1.2 million students set personal goals about money and make wise financial choices. The program also helps empower students to develop, plan and set goals to help protect them from unexpected financial pitfalls. Parents are more likely to give their sons an allowance than their daughters. 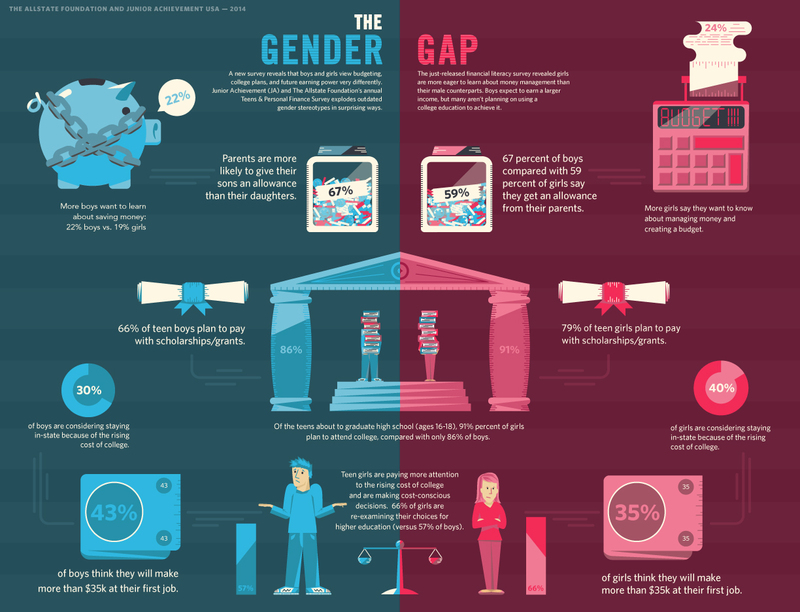 Among all young people surveyed, 67 percent of boys compared with 59 percent of girls say they get an allowance from their parents. Forty-three percent of teen boys think they will make more than $35,000 at their first jobs, compared with 35 percent of teen girls. When it comes to financial literacy, boys and girls agree that parents/guardians do not spend enough time talking to them about money-related topics (52 percent of boys and 51 percent of girls among all young people surveyed). An executive summary of the 2014 Junior Achievement USA/Allstate Foundation Teens & Personal Finance Survey is available at www.ja.org. Junior Achievement is the world's largest organization dedicated to giving young people the knowledge and skills they need to own their economic success, plan for their future, and make smart academic and economic choices. JA programs are delivered by corporate and community volunteers, and provide relevant, hands-on experiences that give students from kindergarten through high school knowledge and skills in financial literacy, work readiness and entrepreneurship. Today, JA reaches 4.4 million students per year in 117 markets across the United States, with an additional 5.7 million students served by operations in 120 other countries worldwide. Visit www.ja.org for more information. Established in 1952, The Allstate Foundation is an independent, charitable organization made possible by subsidiaries of The Allstate Corporation. Through partnerships with nonprofit organizations across the country, The Allstate Foundation brings the relationships, reputation and resources of Allstate to support innovative and lasting solutions that enhance people’s well-being and prosperity. With a focus on teen safe driving and building financial independence for domestic violence survivors, The Allstate Foundation also promotes safe and vital communities; tolerance, inclusion, and diversity; and economic empowerment. For more information, visit www.allstatefoundation.org. This survey was conducted online within the United States by Harris Poll on behalf of Junior Achievement USA from February 12-24, 2014 among 1,234 youths ages 8-18. This online survey is not based on a probability sample and therefore no estimate of theoretical sampling error can be calculated.